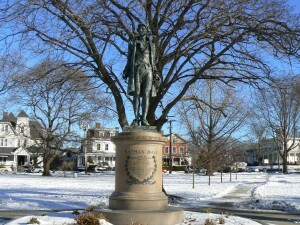 New London honors Nathan Hale and veterans of recent wars with a trio of monuments in its Williams Park. 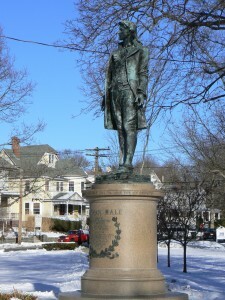 The Nathan Hale statue near the center of the Broad Street park is a 1935 copy of an 1890 statue in New York’s City Hall Park. 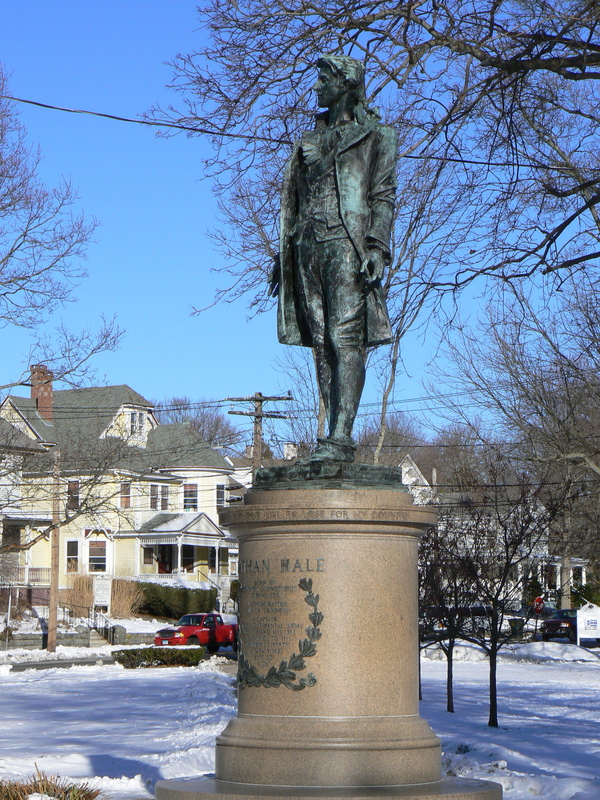 The statue features Hale, a Connecticut schoolteacher and Continental spy who was hanged in 1776 by British forces at the age of 21, standing atop a round marble base with ropes binding his arms and legs. 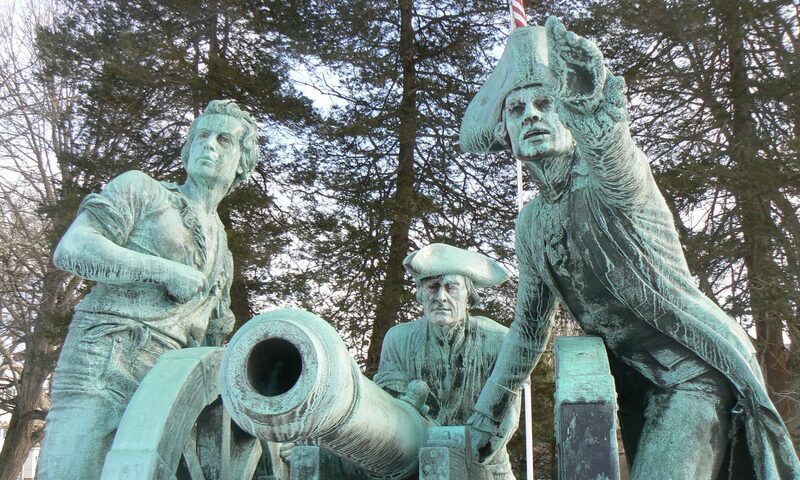 The New London statue is a copy of a statue by Frederick William MacMonnies, who many other works include the Soldiers’ and Sailors’ Memorial Arch in Brooklyn’s Prospect Park and a statue of Charles Lindberg in a Harvard art museum. The text on the base of the New York edition, which was designed by Stanford White, omits the references to Coventry and New London. 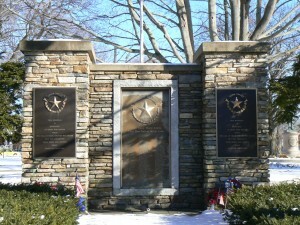 The New London version was cast in 1934 as part of the celebration of Connecticut’s tercentenary in 1935. 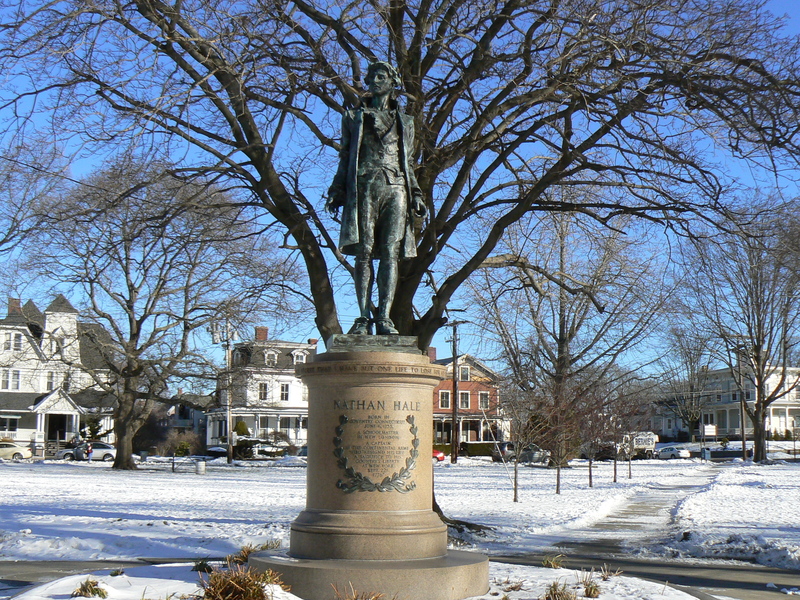 New London was chosen because Hale had taught school in a small schoolhouse immediately before his service in the American Revolution (the schoolhouse now stands downtown, not far from the Soldiers’ and Sailor’s monument). Nice writeup. 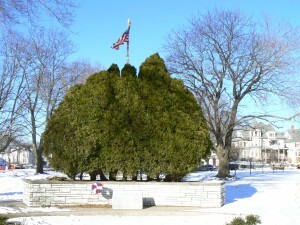 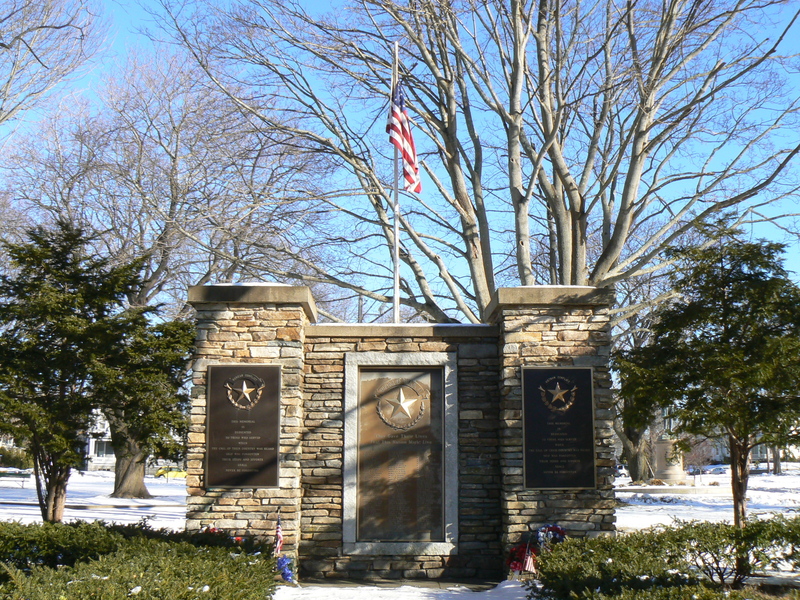 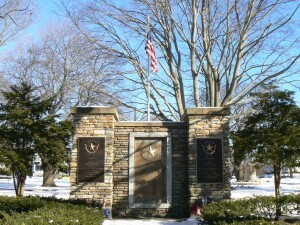 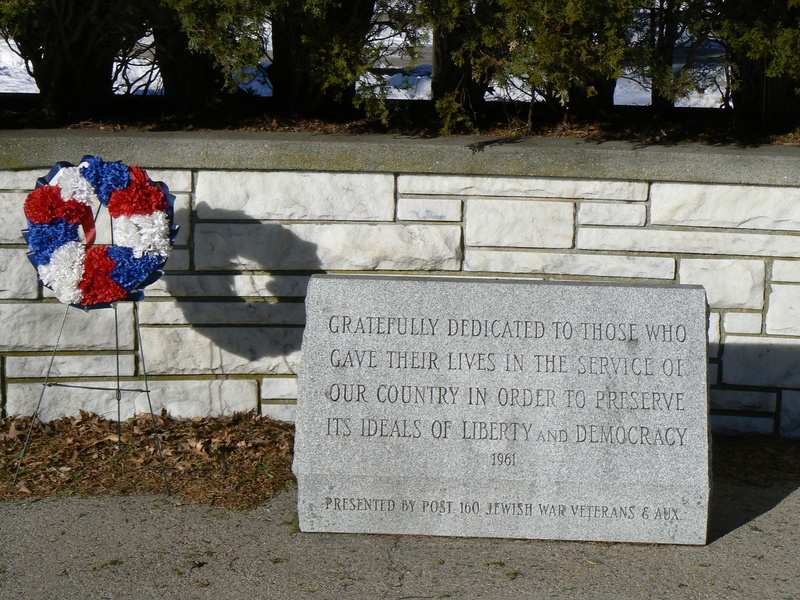 The monument was a gift of the Connecticut Society of the Sons of the American Revolution. 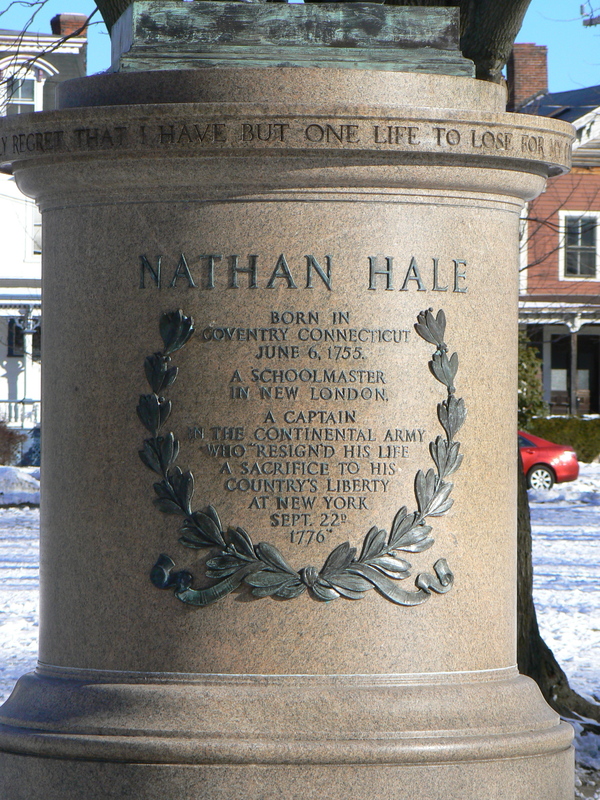 We maintain both Nathan Hale Schoolhouses where he taught in East Haddam and New London.